Aerosol in the Greek language means very fine solid or liquid particles, which are in disperse, either in the air or in a gas. ( Tegopoulos – Fitrakis, Greek dictionary, Edition 1992). The word aerosol derives its origin from the Greek word “αήρ” and the English word “sol”, of Latin origin, which means solution. A few examples of natural aerosols are: fog (mist), clouds, smoke, and dust. Aerosol dispenser shall mean any non-reusable container made of metal, glass or plastic and containing a gas compressed, liquefied or dissolved under pressure, with or without a liquid, paste or powder, and fitted with a release device allowing the contents to be ejected as solid or liquid particles in suspension in a gas, as a foam, paste or powder or in a liquid state". History: Aerosol products were invented for the first time in Norway in 1929, but their marketing started just before 1940. During the Second World War there were used by the soldiers for protection against insects. Today the aerosol products have more than two hundred applications. Actually their use is extended to all the branches of science, of technology as well as to agriculture and medicine. Some examples of their use are: Deodorants, hair lacks, hair mousses, insecticides, paints, as well as aerosol medicines against asthma, for dispersing antibiotics to wounds and many others. In a typical aerosol dispenser the propellant exists in the can in a pressurized liquid face. The propellant, when the button is pressed dawn, forces the liquid concentrate out of the container through the dip tube and the valve which opens when the button is pressed dawn. During the use of the mixture the propellant evaporates inside the container from its liquid face to the gas face, so ensuring a steady pressure and constant spray performance during the whole life of the product. Pushing down the button of the aerosol dispenser, the valve opens and the mixture of the concentrate/propellant ejects out through the valve, since the pressure inside the container is higher than the atmospheric (outside the container). As the mixture is ejected from the dispenser, the liquid propellant is transformed to gas and so helps the concentrate to be sprayed out in the form of very fine droplets (particles). The world yearly production of aerosol products sums up to 10.000.000.000 units; almost half of them are manufactured in Europe. 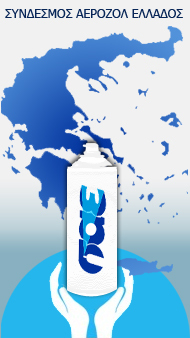 Aerosol production in Greece is approximately 20.000.000 units. An equal number of aerosol units are imported. For many years now aerosol manufactures all over the world, in order to protect the ozone layer in the stratosphere, do not use chlorofluorocarbons (CFC’s) as propellants. For medical uses only and in case there is no alternative, they use it in very small quantities. 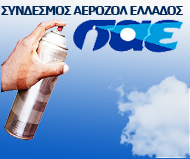 More information about aerosols can be found at home page in the leaflet “Aerosol package”.